18 February 2015, at 8:31a.m. 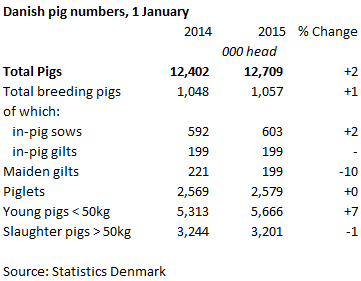 DENMARK - As at 1 January 2015, Statistics Denmark reported a two per cent increase on the year of the country’s total number of pigs, to 12.7 million head. This is a slight seasonal decrease on the October 2014 figure, which had seen the herd reach its largest size since 2010. The breeding herd increased by one per cent on the year, being made up of more in-pig sows, suggesting an increase in the number of young pigs can be expected in the next quarter. In addition, while the number of pregnant gilts remained stable on the year, they were up on October. Maiden gilt numbers, however, were down 10 per cent on the year, which may suggest there is caution about any further expansion, given the low prices and poor profitability of recent months. Piglet numbers were reported to be similar to last year in January. Weaners (under 50kg) though were more abundant, at 5.7 million head, up seven per cent on the year. As slaughter pig numbers, however continued to fall, it is evident that the weaner export industry remains robust despite the continued pressure on finished pig prices throughout the main buyers of Danish weaners. This suggests that the downward trend in Danish slaughterings is set to continue into 2015, despite further increases in piglet production.